An 85 million-year-old marine reptile that roamed the world's oceans during the time of the dinosaurs behaved similarly and shared physical traits with killer whales. That's the finding of a study that examined Tylosaurus mosasaurs, which grew up to 50 feet (15 metres) in length. The enormous creature, featured in the hit movie Jurassic World, were at the top of the prehistoric food chain and had no natural enemies, due to its intimidating size and fearsome appetite. 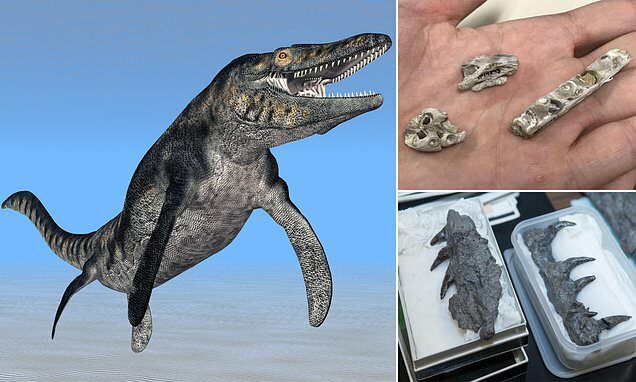 Scientists studying small pieces of a fossil first found in 1991 in Kansas now believe it to be a baby T mosasaur that perished shortly after birth. Analysis of the bone fragments from the snout, skull and upper jaw led experts to conclude that these extinct predators behaved similarly to modern-day Orcas. Scientists have been unable to provide a definitive answer to the fossil's identity despite it being first spotted more than 25 years ago. Paleontologists knew the specimen belonged to the mosasaur family, a group of large marine reptiles, but couldn't determine which. The specimen was initially identified as a mosasaur called Platecarpus, a species commonly found in that area during the same period 85 million years ago. Mosasauridae is a group of animals which features more than 30 genera of species, so identifying a particular specimen from a handful of fossil fragments can be daunting. Researchers from the University in Cincinnati have no discovered after decades of careful analysis that the bones represent an infant Tylosaurus mosasaur. The fossil's structure and the absence of the species's trademark snout made identification difficult and confused the investigating academics.